Sensory issues affect an average of 1 in 6 children in the United States today. Children who struggle with sensory issues have trouble processing information received through the senses. For example, a child with a sensory aversion to loud sounds may cover his ears and hide from a noisy holiday party. Avoid Peak Crowds: Waiting for the mall Santa in a long line on the weekend before Christmas may be a recipe for disaster when it comes to sensory issues. Look for sensory friendly opportunities (many malls now offer "Sensory Santa," for example) or visit attractions before/after the crowded times. It may take a call ahead and a little planning, but making your child feel more comfortable will be worth it. Educate on Sensory Behaviors/Communication: Unless you have been exposed to sensory communication (for example, knowing a child who "hug-tackles" cousins because he needs the sensory input), it can be difficult to understand sensory-driven behaviors and even more difficult to respond positively. Communicating in advance with friends and family can help to make encounters a more positive experience for your child. 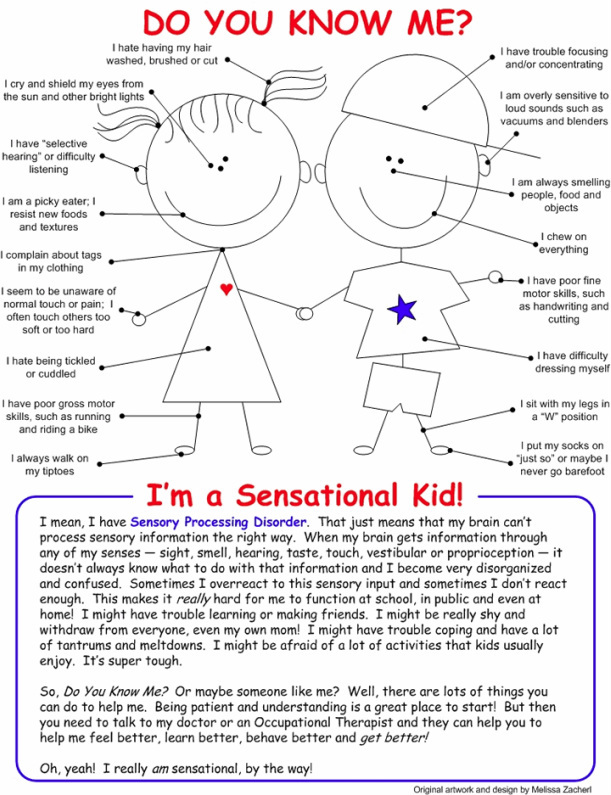 If you're looking for help to talk about sensory issues, there are a number of books available (for example, "The Out of Sync Child") or try using a simple info-graphic, like this one. Expect Clothing Issues: For children with sensory issues, finding clothing that feels comfortable but still fits the expectations for holiday dress can be difficult or even impossible. Stick to comfortable, preferred clothes whenever you can. Pack Your Sensory Diet: If you are traveling for the holidays, make sure that favorite sensory items are packed to go with you. Consult with your child's occupational therapist for alternatives if a particular sensory item or activity doesn't travel well. Plan Sensory Safe Areas: As introduced in the Anxiety, Behavior and Social Challenges section, a safe area can give a child and his or her family a place to decompress away from sensory inputs that may be triggering overstimulation. Any quiet room, away from crowds and noise, will work. Or, if a room is unavailable, you could go for a walk, take a break in the car or hang out in the back yard. Sensory seekers may also appreciate ways to get input (such as an invitation to jump on the back yard trampoline or squeeze some Play Doh).